Since 1998, the Black & Tan Grille has worked diligently to establish a reputation as a premier dining location in Northeastern Wisconsin. The cuisine is best described as nouvelle; using the finest ingredients to create a unique flavor with unmatched presentation. Its chefs also add a bit of fusion-cooking, mixing classic ethnic variations to create combinations which tantalize the palate. 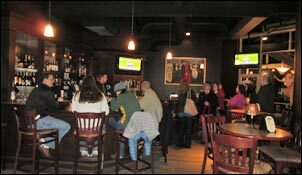 My wife and I really enjoyed going to the Black and Tan when it was in De Pere and we were pleasantly surprised to find that we enjoyed it just as much in the new location downtown. I ordered the tuna wellington and it was cooked to perfection and did not have a lot of crust which is great. My wife ordered the classic Black and Tan steak and it was great as usual. Parking can be a bit of an issue but it is well worth it. I went into downtown Green Bay for dinner at the Black and Tan fine dining restaurant, which is housed in the historic Bellin building. The restaurant carries contemporary American cuisine. Their lounge and bar is on the first floor, while the main dining room is located on the second floor. As you walk into the Bellin building, through the glass doors, you notice the hostess stand for Black and Tan. It is situated in front of the bar lounge room. The hostess was very personable and told me it was a busy night and if I did not have reservations, which I did not, it would be a good 45 minute wait. I then went into their lounge for a cocktail till there was a table open upstairs. The lounge area is very expansive with massive floor to ceiling windows surrounding three fourths of the room. There is a large bar towards the back with a few flat screen TV’s that are situated throughout the lounge. There are many cocktail tables and also a separate comfy seating area with leather sofas. The décor is contemporary style done in dark warm colors of browns and blacks which gives a classy look. My server was very friendly and professional. He brought me their wine and martini list, and told me of all their different specialty beers they carried. He also asked if I would like to order an appetizer while I waited or if I wanted to, I could also order off the main menu and dine in the lounge versus having to wait for a table upstairs. I decided to wait and ordered a glass of Pinot Noir from their wine list for $8.00 and passed on the appetizers. During my wait the server and even the hostess came back a few times to inform me on the status of how long my wait would be, which I appreciated greatly. When my table was ready the hostess brought me up the beautiful marble staircase and sat me at a table by the window which looked out onto downtown Green Bay and the Fox River. The dining room upstairs opens up to a very large area with high ceilings and very massive windows that surrounds most of the dining room. The décor is elegant with a color theme of black and tan colors. The only minor complaint I have is that the lighting was too bright. I normally do not like when the lighting is so dark where it is difficult to read the menu, but when they have it too bright it takes away from a cozy intimate atmosphere. My server was prompt and very sweet, she brought me ice water and told me of the specials for that evening and asked if would like a cocktail. I decided to order their sweet yellow curry salmon entrée for $26.00. This included their soup du jour or a salad of mixed greens. I ordered the salad with their homemade parmesan pepper ranch with goat cheese dressing. My server then came carrying a large wicker basket filled with various bread slices of French, onion walnut, green and black olive and roasted red pepper with asiago cheese. I chose the green and black olive bread and the onion walnut, she placed my bread on a plate with tongs and then artfully presented on another small plate freshly grated parmesan cheese which she then swirled around the cheese extra virgin olive oil and then added a splash of balsamic vinegar. The breads were very fresh and tasted delicious soaked into the vinegar and oil mixture. My salad arrived soon after, it was nicely chilled and I was impressed with how rich and dark the greens were; each piece was cold and crunchy. The salad was very deep and contained cucumber slices, red onion and tomato on top. Their homemade ranch dressing was superb. I enjoyed the added goat cheese which gave the dressing an added richness. Soon after, my entrée arrived. It was a nice thick piece of fresh salmon topped with slices of cooked onion, and surrounding the salmon was yellow curry sauce with risotto. There was even some asparagus on the side. The salmon was nicely done and moist. The seasoning of sea salt on the salmon with the creamy soft texture and sweet flavor of the risotto was fabulous; it had such a nice combination, it was outstanding. My salad and salmon were so satisfying that I did not have any appetite for dessert. My experience at Black and Tan was very gratifying, from the customer service as I walked into the building, to the quality of the cuisine and right down to the end of my meal.